It is with heavy heart that I share the news that club member Alice Goodwin died this afternoon, from "the discourtesy of a particularly fast-moving pancreatic cancer" (her son Daniel's words). The disease acted so quickly, that it's still hard to believe she is gone. Alice has been a fixture at the Seattle club for over 20 years, coming regularly almost every week. The rare times she was away, she was off to a Scrabble tournament, or visiting family, or traveling around the world to experience something interesting or new (from a solar eclipse to visiting Machu Picchu). Alice was a pleasure to play with, and was comfortable playing with anyone. She was particularly good with players new to club, welcoming them into our world. March 13th update: Dan said that they are expecting to have a memorial for Alice, but probably not until May. Read Dan's post and remembrances of Alice on our Memorial Page. The new words (what we have been calling OWL4 and what NASPA is calling OTCWL2018) are authorized for club and tournament play starting March 1st, 2019. We will start using the new words at the February 26th club session, with players getting free challenges (with respect to the new/changed words only) for the first month (through March). For the full list of changes, you can login to the NASPA website and download the list and print it for yourself (after logging in to the Member Services page, scroll down until you find the list of OTCWL2018 documents). NASPA's document is 16 pages long(! ), so we've made a more compact version (just 10 pages) with all the changes that you need: OTCWL2018 Update.pdf Our document also lists the deletions, the number of new words by length, and the words added to OTCWL2018 but not added to OSPD6. The first page is just all the new 2s-8s and the deletions, if that's all you want to start (we'll have copies of the single sheet at club). Players can use and refer to the list of new words (and deletions) while playing, during the transition period. If you challenge a play that includes a new word and the play is ruled acceptable then you don't lose your turn. If you make a play that includes a deleted word* and your opponent challenges successfully (because that word is now no longer good), you can take back the play and make another play, with no loss of turn. We have been informed by UFM that our monthly rent will go up from $260 per month to $350 per month, starting in April. This is the first rent increase in over 9 years (the last increase was in October 2009). The increase works out to approximately $21 more per week [($350-$260)*12/52 = $20.77], so we need to increase the club fee to cover the difference. Starting next Tuesday, February 26th, the club fee will go up two dollars to $10. The discounted rate for the club director (Rebecca Slivka) and club statistician (Ken Clark), will increase from $4 to $5. The price increase last summer has stabilized the club cash flow at our current attendance rates, so this increase to cover the higher rent should allow us to maintain the current level of operations without any other changes. Thank you for continuing to come and support the club! Steve Wilkie died early in the morning on February 20th. Kathy Wilkie (Steve's mother): He is finally free, we are so glad for his suffering to be over. Steve was a regular at Seattle club until April 2003, when he was attacked on the way to work. The injuries were severe and debilitating, and Steve required full-time care ever since. (see: news articles about Steve). There are no plans for a public memorial. Due to continued snow and icy conditions, club for February 12th has been cancelled. After last week's closure due to icy conditions, we'd hoped to meet this week - but no such luck. At this point, we're hoping things clear up enough to meet next week. We'll keep you posted! UFM will be closed on December 25th, so there will not be a club session that day. Club will be in session as usual on Tuesday, 1st of January, 2019. Congratulations to Chris Grubb and Jennifer Summerville for winning their divisions. This was Jennifer's first tournament and she went 6-1 to earn an initial rating of 1478. Way to go Jennifer! And congrats to Adam Henderson and George Bissonnette for finishing in the money (fourth place for each). Complete results are available at cross-tables. Prize winners are shown below. New Words? OSPD6 is out, what about OWL4? In April 2018, Merriam-Webster announced an update to the OSPD (Official SCRABBLE Players Dictionary) to be released in September of 2018. At that time, NASPA had NO information about when the official word list used for club and tournament play (the OWL) would be updated, and gave no answers to questions about the schedule for release of print OWLs or updates to Zyzzyva. Fast forward to now, and the new edition, OSPD6, was officially published 1 September 2018, but still no details yet from NASPA about when we can expect an update to the OWL. According to a NYT article, John Chew said that the OWL "won't be updated with the new Merriam-Webster additions until early next year" (i.e., 2019). So, you can look at OSPD6, but we don't know if all the OSPD6 words will be in the new OWL (OWL4? ), or what additional words will be added or removed from the OWL until there is an official release from NASPA. We also don't know if the numerous discrepancies between OSPD5 and OWL3 will be resolved (perhaps someone with OSPD6 can look through it and at least see if they added some of the OWL3 words to OSPD6?). When OWL3 was released in August 2014, NASPA did NOT provide a list of the new words, forcing players to mine the dictionary themselves to develop the list of the changes. Ideally, NASPA will have learned from the negative experience of the OWL3 transition and this time around they will publish the new words, but if they don't then we'll have our work cut out for us again. Some observations: The new words can't go into effect for tournament (and club) play without giving players at least a few months between the release date of the OWL and the effective date - to give folks enough time to learn them. Ditto for the new words being available on Zyzzva (for word adjudication and study). By my estimation, if they want the new words to be in use for National's next year, they'll have to release the OWL and a working version in Zyzzyva! no later than April 2019. If they can't make that date, then they'll probably wait until after National's - or release it at National's for an effective date late in 2019, or even into 2020. Remember, OWL3 was released in August 2014 and was supposed to go into effect December of that year, but the effective date was delayed an additional 5 months(! ), to April of 2015. Alec and I had a great time at NASC 2018 in Buffalo! Alec started off strong, winning five of his first six games - the other game was a tie - and leading the field after rounds 3, 4, and 6. He hit a rough patch after that, but was able to recover and finish 18.5 - 12.5, in ninth place. A familiar name, Nigel Peltier, finished just ahead of him in eighth place. I went 17-14 in Division 3 to end up in 26th place out of 105 - which was a pretty good comeback, since I was in 98th place after 16 rounds. The Puget Sound region was also represented by Evans Clinchy, who dominated the Collins division at 23-8, winning the Collins title two games ahead of 2nd place. Bharath Balakrishnan of Redmond also played in Collins. On the TWL side, former Seattle club player Rafi Stern finished 17th, and Tom Bond also played in Division 1. Mark Peltier went 16-15 in Division 2, and Michael Kirkland went 16-15 in Division 4 in only his second tournament. Additionally, Alec was featured on the Twitch Stream on the fourth day of the tournament (there are interviews of Alec at 47:15 and 2:03:30 into the video). Starting next Tuesday, August 7th, the club fee will go up one dollar to $8. Additionally, the club director (Rebecca Slivka) and club statistician (Ken Clark), will pay a discounted rate of $4 (they had been paying nothing for the past few years, as a small perk for their contributions). We will also stop giving out the $1 category prizes (the only prize we've given out for several years now). This price increase is necessary to bring in enough to cover the club's monthly expenses - and hopefully will be the last increase for a while. As we discussed at club last week, our attendance the past few years has not been enough to cover all the club costs without dipping into the club savings. Seattle Scrabble Club co-founder Ann Ferguson died on June 20, 2018. Ann not only helped found our club (in 1985), but was the primary director of the club until 2000. She enjoyed the game and camaraderie of the club. We will miss her. You can read more about Ann's life in her obituary. If you want to share remembrances of Ann, you can email Rebecca and she will post them on the club Memorial page. Funeral services will be held at the Church of Jesus Christ of Latter-day Saints, Mountlake Ward (22015 48th Ave W, Mountlake Terrace), June 23, 2018. A viewing will begin at 10:00, and services will begin at 11:00. A graveside service and final interment will take place the following week at the Taylor Cemetery near Idaho Falls, Idaho. Once again, our club has been invited to participate in the Seattle Chamber Music Society's "Music Under the Stars" events at parks in Seattle this summer. The dates this year are: July 6, 13, 20, and 27 (all Fridays), at Freeway Park, from 6:30pm until 9:00pm (or dark). They will have tables and chairs for us, free BBQ (and they've said you can bring your own food to grill as well). Each night, there will be a live student performance, followed by KING-FM's broadcast of a Seattle Chamber Music Society concert streamed directly from Benaroya Hall. You'll of course need to bring your own equipment (board, tiles clock, score sheets, writing instruments) each time you attend. Directions: enter Freeway Park from Seneca Street, between 6th Ave and 7th/Hubbell Place. If you can't take the bus, then your best bet to find parking is up the hill. Adam Henderson ran another successful one-day tournament on November 4, 2017. Lynn Dreyer took first place in the second division. Chris Grubb, Chris Sjoholm, and Norm Garvin placed second in the top, middle, and bottom divisions, respectively. See full results on cross-tables or NASPA crosstable. Starting next Tuesday, October 17th, the club fee will go up one dollar to $7. This is the first fee increase since 2010. As we discussed at club last week, our attendance the past few years has not been enough to cover all the club costs without dipping into the club savings, but this small increase should allow us to keep going without any other changes. Mike Baker directed the Annual Portland v. Seattle Interclub Challenge this year. We had 34 players (17 on each team). Congratulations to Adam Henderson for winning Division B and George Bissonnette for winning Division C. Congrats also to Chris Grubb and Rachel Christensen for placing second in Divisions A and B, respectively. Adam also won prizes for high game and high play, and Tom Bond got high play prize as well. Final standings with prizes shown below (*note that Div C prizes were slightly lower because there were only 10 players in that group). You can also view the results at cross-tables.com. Yesterday, we staged the 30th edition of the Portland - Seattle Interclub Challenge at a midway location - Chehalis, Washington. Portland had an average rating advantage of over 100 points, but Seattle and Portland players meet so often that the ratings don't always tell the story. However, Portland overcame its ratings advantage this year to pull out a 63 game to 56 game victory after 7 rounds. In the A division, Portland had been ahead by 14 games after round 5, but Seattle gave us a nasty scare by winning 11 of the remaining 12 games. Thanks to Noah Walton and Carl Johnson for assistance in setting up the venue, Dan Goodwin for tracking the team standings and especially to Rebecca Slivka for organizing the Seattle team and helping with the data entry throughout the day. Note about Kit Carson: Many people were unhappy with the very limited menu they had us order from in the back room (no vegetarian options, no breakfast, etc. ), so we will talk with the venue to make sure that doesn't happen again next year. Also, the bar didn't open until later, and that was also a concern we will share. Although Seattle will not be in the path of totality, the sun will be partially obscured by the moon during the eclipse and that is the most dangerous time to look at the sun without adequate protection (because your eye perceives that the sun is not as bright so it might not hurt to look at the sun, but the sliver of sun that IS visible can still do just as much damage as the full disk). 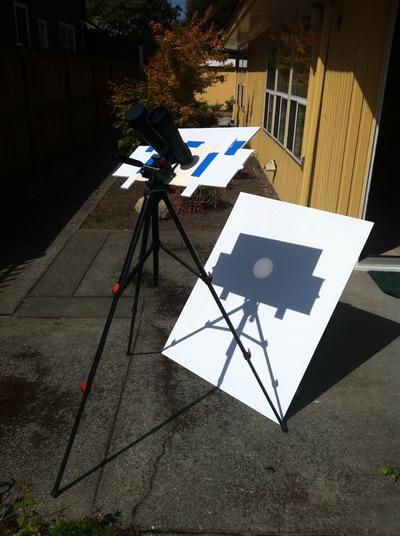 build a pinhole camera for indirect viewing. Check out the NASA website for details on Eclipse Viewing Safety. Science Friday also has good information and links. The American Astronomical Society has published a list of Reputable Vendors of Solar Filters and Viewers. Don't wait until they're sold out! Order yours now. At the August 12th one-day tournament in Portland, Alec Sjoholm won all his games (including besting Dave Wiegand twice) to dominate in the top division. Adam Henderson won the second division, and Chris Sjoholm came in second place in the bottom division. Nice job, guys! Alec Sjoholm finishes 4th at Nationals! 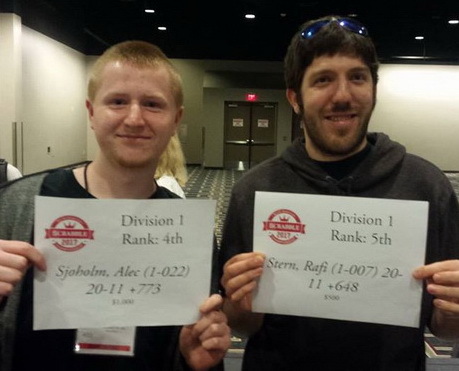 Congratulations to Alec Sjoholm for finishing in 4th Place at this year's North American SCRABBLE Championship! Alec ended the tournament with a record of 20 - 11 in the top division, and will earn $1000 in prize money. He just edged out former Seattle club member Rafi Stern by 125 spread points. Once again, our club has been invited to participate in the Seattle Chamber Music Society's "Music Under the Stars" events at parks in Seattle this summer. The dates this year are: July 7, 14, 21, and 28 (all Fridays), at Freeway Park, from 6:30pm until 9:00pm (or dark). They will have tables and chairs for us, free BBQ (and they've said you can bring your own food to grill as well). Each night, there will be a live student performance, followed by KING-FM's broadcast of a Seattle Chamber Music Society concert streamed directly from Benaroya Hall. You'll of course need to bring your own equipment (board, tiles clock, writing instruments) each time you attend. Results for yesterday's one-day tournament have been posted on the NASPA website. Prizes: 1st place: $125, 2nd place: $90, 3rd place: $50, 4th place: $25. Congratulations to Alec Sjoholm and J Midori Howard for finishing in second place in division one and two, respectively. Congrats also to Adam Henderson for his directorial debut. Adam Henderson is our newest apprentice director and will be directing his first tournament on Saturday, May 13th, 2017. Jane Bissonnette will be mentoring Adam through the tournament. Details and signup information for the tournament can be found on Adam's Tournament website. See who's signed up so far. Page 2 Books is starting a monthly games night at the store, and we're launching it with everyone's favorite vocabulary game. We'll have multiple tables set up, some fun prizes and giveaways, and Scrabble dictionaries and games for sale. In the future we'll be adding other games. Come join the fun. Note: if you do go, remember that this is an open event so be gentle with the other players. NASPA announced today that an update to the Official Rules has been published that goes into effect 4 January 2017. The new rules are available in a PDF that can be viewed or downloaded. You can also read a list of the changes on the NASPA website. begins tonight at 6 PM. We will maintain access to shops and businesses at all times. and NE 45th streets, and in Zone E, on the University Bridge. Crews will return in about 2-3 weeks to paint final pavement markings. NE 65th and NE 53rd streets. when crews return to paint permanent lane markings. in about 2-3 weeks, when crews return to paint permanent lane markings. Be careful not to park in the new protected bike lane. for construction or access impacts. up to date through the end of construction. Contact the project team at (206) 727-3575 or RooseveltCorridor@seattle.gov. Thank you for your patience and support through construction. We will strive to minimize construction impacts as much as possible. Congratulations to Jane Bissonnette, who finished in fourth place in Division 3 at this year's Nationals in Indiana! See links in the article below for more details on the tournament. Facebook - Jesse Matthews doing interviews, etc. NASPA sent an email yesterday evening announcing what appears to be a minor update to the Official Tournament and Club Word List (aka OTCWL2014 or OWL3). This updated list, which they are calling OTCWL2016 and we are referring to as OWL3.1, is set to go into effect for club and tournament play 1 September 2016. They have made the list of new words available on the NASPA website*, so you can see the changes and print your own addendum. One nice thing they have provided is a list of all the new words along with definitions. It is not clear if the new printing will use a higher quality paper than the cheap 2014 printing (although there are rumors to that effect), nor do we know if they are using a monospace font in the new printing (for easier adjudication). While they are offering a discount for purchasing new print copies (if you order by August 3rd! ), it doesn't seem economical to bother given the uncertainty of the quality of the printing and the fact that we can just append the new word list to the 2014 printed book. For these reasons, club does not plan to order printed copies of the OTCWL2016 or coordinate a bulk order. NASPA also announced that "a new version of NASPA Zyzzyva that includes OTCWL16 as well as the Collins SCRABBLE Word List 2015 will be released in August." That is all the information we have [updated August 1st with links to new word documents]. Please direct any questions to NASPA. Once again, our club has been invited to participate in the Seattle Chamber Music Society's "Music Under the Stars" events at parks in Seattle this summer. The dates this year are: July 8, 15, 22, and 29 (all Fridays), at Freeway Park, from 6:30pm until 9:00pm (or dark). They will have tables and chairs for us, free BBQ (and they've said you can bring your own food to grill as well). Each night, there will be a live student performance, followed by KING-FM's broadcast of a Seattle Chamber Music Society concert streamed directly from Benaroya Hall. With the recent low turnout for the May 14th tournament, and the cancellation of the June 18th tournament, director Lynn Dreyer is looking into other possible formats and locations for future one-day tournaments. To that end, she has sent a detailed survey to previous tournament players asking for input. If you have not received a survey, but would like to weigh in, please e-mail Lynn. It was an interesting experiment, but the club attendance can't support giving out more prize money, so we're back to just $1 for each Category Prize. We will meet every 2nd and 4th Wednesday. Our intention is to play up to 4 games and have a single prize each evening for Highest play, highest game and possibly a category word for the evening. We are asking $2 per player. All money will be given back as prizes after we have covered any minor expenses such as making copies. For more information, email Tod or email Claudia. Players signed up for March have been moved to the April 16th tournament (or other future tournament of their choice). Starting with last week's club session (January 12th), the category prizes are $3 for each winner. They had been just $1, in order to build up the club savings, but the club is doing well enough that we can afford to give out more in prizes again. One-Day Tournament Schedule for 2016 Announced! Lynn Dreyer and Rebecca Slivka are working together to organize one-day tournaments for 2016. The first five have been sanctioned by NASPA and you can sign up any time (click on one of the date links below for details). New for this year: we are offering a Collins (CSW) division! You can also learn about these and other tournaments on our Tournaments page. University Friends Meeting has notified us that we are supposed to dispose of all garbage/recycling before we lock up the Social Hall after club. If any trash/recycling is left behind (even in the trash can), we will be charged a cleaning fee (minimum of $15). To avoid this, we are asking all club members to take their trash/recycling home with them. p.s. Yes, the soiled paper towels in the bathroom can still be put the bathroom trash can - but no outside trash. thanks. As we all discovered last week, NE 40th Street (between Roosevelt Way NE and 9th Ave NE) is closed because of construction across the street from University Friends. The closure began September 28th and will continue through October 28th. Rebecca has signed up for the monthly construction bulletin on this Exxel Pacific project ("41st & Roosevelt"), so we should get advance warning for any future closures in the area. The project manager said that this should be the only major closure of NE 40th, since the City of Seattle had them change from many short closures spread out for months to the single one-month closure we are dealing with now. Note: As of November 3rd club session, NE 40th Street has reopened. There are no plans to close it again (that we know of). The November Construction Bulletin shows what is happening with the project and closures of neighboring streets and sidewalks. This year, Portland had a strong day and won it back, 68 1/2 games to 43 1/2. Kolton Koehler had a monster day and won the A division, 7-0, +1202, running about a 535 average (!). Scott Smith came from the 15th seed out of 16 in the B division, to win with a 6-1, +324 record, gaining about 120 rating points. The tournament ran extremely smoothly, with no problems and no director calls, which made it a pleasure for me. Thanks to all the players, and especially to Jane and George Bissonnette, who got everything set up and ready to go, while I was busy connecting and firing up the computer. Congratulations to Tod Taylor for coming in 4th place ($500) in the second division! Tod just made the cutoff for the playoffs and won his quarterfinal series, but then lost in the semifinals. He was seeded 54th and came in 4th, so his rating should go up quite a bit, too. Nice job, Tod! Alec Sjoholm won $125 for Division 1 Class C Rank: 2nd (I don't know what that means, but you can see all the Prizes at NASC Prizes. Alec also played at Table 1 on the first day so you can step through his annotated game. Lots of Seattle players made the trek to Reno for this year's NASPA Championship tournament. There were 4 divisions, plus one Collins division, with playoffs each each division. After 21 games, the top 8 players in each division played in quarterfinal and semifinal matches yesterday, and finals today (meanwhile the remaining players continued in their respective divisions for glory, spread points, and a few dollars in prize money). Former Seattle club players Charles Dupont won division C ($2500! ), and Jim Porter came in 10th place and won $250 in Division B. Charles won Division D last year, and Division C this year, so next year...? Not sure if anyone else won money because the NASPA results mix the playoff and non-playoff results. Please remember that Club starts at 6:00 pm. We rent the Social Hall at University Friends Meeting for the 4 hours from 6pm to 10pm. But, for quite a while now, the building has been unlocked earlier so we could get in at 5:45 or 5:30. Then folks started coming before 5:30, but we are not paying for that extra time and it is not on their schedule. UFM is being more security conscious now and not leaving the building unlocked, so the caretaker will not be unlocking the building until just 15 minutes before our scheduled start time (6pm), so the earliest we should expect to be able to get in is 5:45pm. Please do not try to get into the building/Social hall before 5:45pm. If you get there early, please just wait outside. Don't call the caretaker if the building is locked unless it is after 5:45pm. Once again, our club has been invited to participate in the Seattle Chamber Music Society's "Music Under the Stars" events at parks in Seattle this summer. The dates are: July 10, 17, 24 and 31 (all Fridays), at Freeway Park, from 6:30pm until 9:00pm (or dark). They will have tables and chairs for us, free BBQ (and they've said you can bring your own food to grill as well). This time there will also be live music, which will be broadcast on KING-FM (98.1). Like last year, we need at least 2-3 people to sign up for each night, and hopefully one those people will be responsible for bringing word list printouts, club info cards, and score sheets (I'll provide a packet for each week). If you already have a date you want to commit to, please let Rebecca know so she can add your name to the schedule. You'll of course need to bring your own equipment (board, tiles clock, writing instruments) each time you attend. Ken Clark and Mark Peltier battled a very fun, high-scoring contest at tonight's session. When it was over, they set lots of Club records for 2015, but, more impressively, they got on the ALL-TIME Club records page with THREE new All-Time records (!!) Not bad, considering Club has been keeping records for about 24 years. You can replay the whole game step by step to see the details. Also, this was the last night at club to use the new word cheat sheets, but they didn't play any new OWL3 words in this game. Beginning Tuesday, February 17th, we will start allowing the use of the new words at club. Because the new words do not officially go into effect until April 10th, players will be allowed to use and refer to the OWL3 Cheat Sheet [DRAFT] at club during the transition period. Players will also get free challenges for new words (i.e., you will not lose a challenge if one of the words being challenged is new to OWL3). I have begun updating word lists on the Study Tools Page. Look for the +OWL3 symbol, identifying lists that have been updated with the new words. With the release of an updated version of Zyzzyva that includes the new words (a.k.a. : OWL3 or OTCWL2014) this past weekend, NASPA has announced that the official date for using the new word list in clubs and tournaments is April 10th. You can download the new version (3.0.3) of Zyzzyva from the NASPA website. Note that the new words are only available to current NASPA members; you will be required to "activate" your copy of the new Lexicon by allowing the program to go online and validate your membership at the NASPA website. Please direct any questions about the new words or the new Zyzzyva to NASPA. During the last update, we had a transition period at club where we allowed players to use a sheet with the new words and get free challenges for the new words only, but this time there is no list of the new words only so we'll have to figure out something else to do. We'll discuss it at club over the next week or so. Jane Bissonnette is directing three one-day tournaments this year. Last night, club was visited by reporter Josh Green of King 5 TV. He was interested in learning about our club and doing a story about the impact of the dictionary update. He filmed through the first game and interviewed several players. It aired on the 11:00 pm news last night, but you can also watch it online at: King TV (you'll have to wait through about 12 seconds of an ad before seeing the clip). Seattle club was also mentioned in an article at FiveThirtyEight.com a few days ago: New Scrabble Dictionary Disrepects The Game. As was announced at club this past Tuesday, our attendance for the past year has not been enough to cover all our costs (rent, prizes, photocopying, website maintenance, batteries, new word list, etc.). This has eaten into the club savings and we need to make some short-term changes to build back the club reserves, and then longer-term changes to make sure we avoid a negative cash flow in the future. We will no longer pay prizes except for the Category Prizes, and those will be reduced to just $1 each. Everyone except new novice players will pay the club fee. The club will no longer subsidize the one-day tournaments. 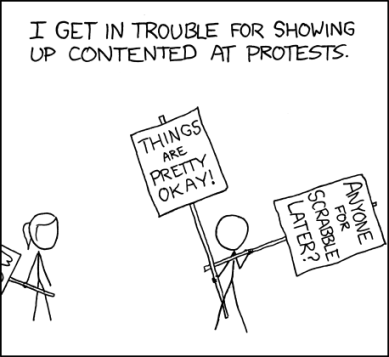 The plan is to do this through January 2015 and then see where we stand. This four month period should allow us to build the club savings back up, at which point we can see about adding back some of the prizes and how we can give some compensation to Ken for doing the stats every week and to Rebecca for directing, maintaining the club website, etc. However, we will not be able to go back to the previous level of prizes unless attendance goes back up to the levels we had several years ago. We also should anticipate that UFM might want to raise our rent in the next year or so (the last time they raised it was in October 2009, which was the first rent increase since we moved there in 2004). Background: The last club fee increase was in July 2010, when the weekly price went from $5 to $6. Prior to that, we had a 5-month prize hiatus from July 2009 through December 2009. Also, we averaged 20 players per week in 2010, but we have only averaged 15 per week for 2014 (year to date). The annual Portland vs. Seattle Interclub Challenge tournament was held Saturday, September 20th in Chehalis. It was a tightly contested tournament, but Seattle team edged out Portland by just 3 games. See Full Results for details. Congratulations to Charles Dupont for winning Division 4 at this year's National Scrabble Championship, held in Buffalo, New York. Charles won his last twelve games and finished with a massive spread of +3023. NASPA has announced that proposed Rules Changes will go into effect Tuesday, September 2nd Wednesday, October 1st Tuesday, October 14th. Please review the proposed changes to familiarize yourself with the differences. Sept 5 Update: Apparently the rules update has been delayed until October 1st (or perhaps later). We're waiting to see the revised rules (currently there is just a list of proposed changes). Stay tuned. Sept 30 Update: Now they are saying October 14th, but there is still no complete version of the new rules available. Oct 2 Update: You can now see the complete new version of the rules. Note that they are now publishing a condensed "player" version of the rules in addition to the Official Rules. NASPA has announced (on Facebook) that the new word list (to be released August 11th at Nationals) will be effective for tournament and club play starting December 1st. They will be selling the hardcopy at Buffalo and John Chew said: "the word list will be available for sale through our website by the end of August." An update to Zyzzyva should be available shortly after Nationals, as well. We don't know the price yet, but since the new book is supposed to contain the entire word list (2-15) and the previous update was more than 8 years ago, we expect the price to be significantly higher than last time. If there is enough interest, Rebecca will coordinate a bulk order for club members to save on shipping. She will send an email to club members with the details when NASPA lets us know (probably not until the end of July). That's all we know. If you have questions, please direct them to NASPA. Update Aug 5: OSPD5 (definitions, expurgated, 2-8 letter words) will be available for sale starting August 8th. You can get it locally at Elliott Bay Bookshop: OSPD5 paperback ($8.50), OSPD5 hardcover ($25.95), OSPD5 large print paperback ($31.95). Sept 30 Update: NASPA announced a delay in the effective date of the new words until they can provide a new version of Zyzzyva to players and directors that will restrict access to the new words to NASPA members. They made no mention of how the hundreds of discrepancies between OSPD5 and OWL3 will be handled. Check out our OWL3 Transition Word Lists to see some of the new words. Ken Clark will host Scrabble at his house on Saturday, May 17th. Please bring some food to share, your preferred score sheets and writing instrument, and your own equipment (if you have it). Starts at 3pm and goes until 10pm, or whenever. Please let Ken know if you are planning on coming, and if you can bring a table & and chairs (he might need more, depending on how many show up). Thanks to Jane Bissonnette for another smoothly run event (held at the Seattle Chess Club) on April 12th. Rebecca Slivka won division B and Ken came in third; in division C, Jane Bissonnette came in 2nd followed by Alice Goodwin in 3rd; and Rafi Stern came in 3rd place in the top division. All the high play prizes were won by Seattle club members. Thanks to Jane Bissonnette for another smoothly run event in a brand new venue (the Seattle Chess Club) on January 25th. Seattle players dominated the top three divisions, with Rafi Stern winning Div 1, Walker Willingham winning Division 2, and Jane Bissonette winning division 3 (with the best record and best spread of the entire tournament, wow!). NASPA sent an email today to its members about the long anticipated update to the word list. As you can see from the quoted message below, there are no firm dates about when the update will actually be available in electronic form, but if the last update is any indication we will hopefully get it at least 2 or 3 months before it becomes official. Look for another update soon. Check the NASPA website for more information and updates (although as of 14 January 2014 nothing about the next update has been posted there). Because of holiday closures of University Friends, there will be NO club session December 24th or December 31st. So December 17th will be the last session of the year (i.e., your last chance to affect your stats for the year). Congratulations to Rafi Stern for winning this year's California Open. With only three losses, Rafi dominated the strong field, including last year's winner (and previous Seattle club member) Mike Frentz. Way to go, Rafi! You can also see pictures from the event at a San Francisco Chronicle article. Jane Bissonnette has announced that the first one-day tournament in 2014 will be held January 25th. It will be held at a new tournament venue, the Seattle Chess Club, in the Northgate neighborhood. Additional dates for one-days in 2014 are tentatively set for April 12th and June 28th. Jane is still finalizing the location for those dates and the tournament information will be posted as soon as the locations are confirmed. While the Tacoma Scrabble Club remains on hiatus, Ken Clark will host Scrabble at his house on Saturday, November 9th. Please bring some food to share, your preferred score sheets and writing instrument, and your own equipment (if you have it). Starts at 3pm and goes until 10pm, or whenever. Let Ken know if you are planning on coming, and if you can bring a table & and chairs (he might need more, depending on how many show up). Congratulations to Tod Taylor for winning the B Division at the annual Portland v. Seattle club challenge held in Chehalis, WA, on a very rainy September 28th. Alec Sjöholm had a great tournament, going 6-1 against the very tough A Division to earn second place, just one spread point behind the winner of the division. Other Seattle players who earned prizes were: Adam Henderson placing 3rd and Ann Ferguson in 4th place in the B division; Karen Powell and Mike Lavoie placed 3rd and 4th, respectively, in the C division; and Dan Goodwin placed fourth in the A division. Tod Taylor also won a prize for high play (ACCIDENT 158 points), and Georgianne Fiorini for high loss. Alas, the team results left the trophy in Portland. They won 69 games, to the Seattle team's 57. Thanks to Mike Baker for directing the tournament. Check out the results on cross-tables.com or the NASPA cross-table to see the new ratings. 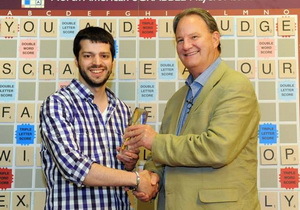 Congratulations to Rafi Stern for winning the 2013 Can-Am SCRABBLE Challenge Tournament in Vancouver, BC, held September 21-22. The tournament pitted the seven highest rated qualifying players from Canada and the United States against each other in a team challenge format. And, the US team won the challenge, too. The NASPA Rules Committee has released the updated, final version of the new Rules, which become effective September 24th (delayed from the previously announced Sept 5th effective date). Visit the NASPA website to read and print the Rules. A printed version will be available at club, but there are enough changes that you should review the entire thing yourself. All club and tournament players are expected to know and follow the rules, so please use the next two weeks to familiarize yourself with the changes. IV.I.3 Challenging the Play : A verbal challenge is no longer binding. You must declare that you are challenging AND neutralize the clock, or begin the adjudication procedure to indicate a binding challenge. While the Tacoma Scrabble Club remains on hiatus, Ken Clark is stepping up to host Scrabble at his house on Saturday, August 17th. Please bring some food to share, your preferred score sheets and writing instrument, and your own equipment (if you have it). Starts at 4pm and goes until 10pm, or whenever. Congratulations to Rafi Stern for finishing in 8th place in the top division at the 2013 National SCRABBLE Championship Tournament in Las Vegas, held July 20-24th. The winner of the tournament was Nigel Richards (for the 5th time!). If you are interested in learning top level strategy, I encourage you to review the games played at the top table. They are annotated, with Quackle notes, and give you a chance to see what expert players choose to do. Nigel not infrequently forgoes bingos in the endgame in order to win. Other Seattle club players who did well are Charles Dupont, who finished 12th in Division 4, Nancy Roeder who played up into Division 3 and finished 27 places above her seed rating, and Scott McManus who also played up into Div 3 and finished 12 spots above his seed rating. The NASPA Rules Committee has a lot of changes proposed to the rules and have published the draft update on the website for comments. The new rules are planned to go into effect September 5th, so speak fast (i.e., send email to the Rules Committee) if you have any concerns/suggestions. Congratulations to Rafi Stern for winning the top division at the Mind Sports International Tournament in Las Vegas, held July 5-6th. It was a hard fought battle in an elite group. Nice going, Rafi! Hasbro has cut funding for the NSA and will take over its functionality inhouse. See announcement from John Williams at NSA reproduced below. FYI, Scrabble Word of the Day has already been moved to hosting at NASPA. It remains to be seen what will happen with the Casual Clubs list, Word Gear, etc. NASPA clubs and tournaments are not affected by this change. "After 25+ years, the National SCRABBLE Association (NSA) will be officially closing its doors, effective July 1, 2013. Hasbro will now internally manage all SCRABBLE brand marketing, publicity, Consumer Affairs and Community Relations Efforts. We are choosing instead to focus on the amazing experience we've had over the years promoting the SCRABBLE brand and spreading the word about the world's greatest game. We sincerely thank everyone who has been a part of this effort." Beginning July 1, 2013 Hasbro will internally manage all SCRABBLE brand marketing, publicity, Consumer Affairs and Community Relations to better align all SCRABBLE-related efforts with larger Hasbro marketing and community relations activities. As we move forward towards that date, the NSA will be helping Hasbro create a comprehensive Internet source to answer consumer questions, assist in sales of product and provide a depth of learning materials. We have provided Hasbro with proper links for tournament and rated clubs to make it as smooth a transition for School SCRABBLE members, Library Members and Casual game players as possible. Hasbro is working diligently to have their Hasbro SCRABBLE website updated and ready in the next few weeks. Since 1982 John D. Williams Jr. and the National SCRABBLE Association have played an instrumental role in promoting SCRABBLE playing with schools, communities and families, including the development of the renowned National School SCRABBLE Program. Together with his partner Jane Ratsey Williams and their amazing team their enthusiasm and hard work has brought the SCRABBLE game to tens of thousands of students, parents, teachers and families and has been invaluable to the brand. Hasbro has not made a decision about the timing for the next National School SCRABBLE Championship. They encourage School SCRABBLE Clubs, organizations and literacy groups to continue to run SCRABBLE tournaments in their communities. Will Hasbro continue the National School SCRABBLE Program? Hasbro will continue to encourage SCRABBLE playing in the classroom and help provide parents and teachers the resources to implement SCRABBLE clubs in schools at a local level. The company will still offer teachers a specially-priced School SCRABBLE Kit and resources on how to start School SCRABBLE clubs at www.Hasbro.com/SCRABBLE. "It is with great sadness that the NSA staff will no longer do the outreach it has," says Jane Ratsey Williams. "The SCRABBLE brand has taken us all over the world and introduced us to so many amazing people who have touched our hearts. All of us at the NSA want you to sincerely know what a special journey it has been for us. Please let us know if there is any assistance we can give you before our doors close July 1." Read archived News and announcements on our Old News page. 19 June 2002: Letter to Editor responding to nerd-stereotyping in previous Seattle Weekly article. 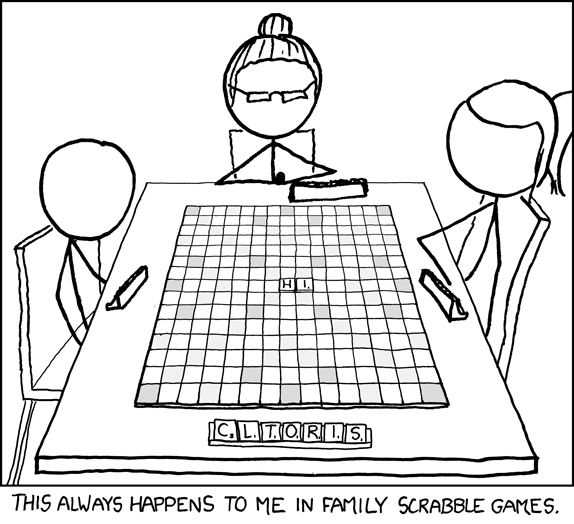 See also Links Page which has lists of movies, etc., about SCRABBLE.